Straight from the "Where have they been?" file comes Fireforce. The last and only time I encountered the power metal band from Belgium was their 2011 debut album March On. But they haven't been completely MIA. Fireforce dropped their second album, Deathbringer, three years later in 2014 It appears that's their recording cycle. Three years on now and Fireforce returns with Annihilate The Evil. Fireforce is the quintessential European power metal band where large roaring riffs from twin guitars are wrapped around a galloping and pummeling rhythm section. Fireforce is one of those power metal bands brisk pacing reigns. Annihilate The Evil begins as a horse race straight from the gate and never really slows down. Songs such as Revenge In Flames, The Boys From Down Under, Dog Soldiers, or White Lily are storming numbers with heart racing speed and blistering solos. Alternatively, Fake Hero and Defector dial back, if only lightly, on the bullet train pace. These two songs sound much more like traditional heavy metal rather than speed metal. But even so, Defector, in the latter half, cranks the speed up once again. In this sense, the album could be considered either consistent or repetitive, depending on your level of indifference. There is something of a curiosity here. Fireforce does a cover of The Rolling Stones' Gimme Shelter, with interesting results. It just goes to show, you can probably turn any song into a heavy metal tune. To say again, Annihilate The Evil is basically Fireforce being Fireforce, delivering classic and bombastic speedy power metal. If you're a fan of the band or the genre, you will probably enjoy this album. 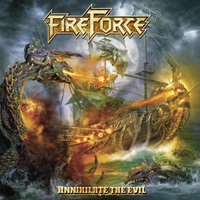 Annihilate The Evil is basically Fireforce being Fireforce, delivering classic and bombastic speedy power metal. If you're a fan of the band or the genre, you will probably enjoy this album.